The eye-catching Super C NeXus Ghost derives its muscle from a 300-horsepower MaxxForce 7 turbo-diesel V-8 engine. This new Super C motorhome is built on the Navistar International TerraStar diesel truck chassis and loaded with luxury. The word “nexus” sounds like “Lexus,” a passenger car that exudes elegance on the highway. And according to Mr. Webster’s dictionary definition, “nexus” means the connection linking two or more things. This past January, the 2014 Ghost, a “Super C” motorhome manufactured by NeXus RV, made its debut at the Florida RV SuperShow. 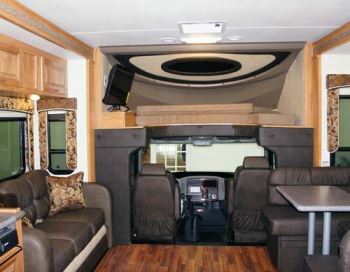 For this model NeXus RV connected an International TerraStar truck chassis with luxurious living accommodations ready for the open road. Consumers can purchase this new model and other NeXus motorhomes directly from the company as part of its successful factory-direct sales and marketing program. I visited the NeXus RV facility in Elkhart, Indiana, to inspect the Ghost 34G prior to the Florida RV SuperShow. My test unit had just come off the manufacturing floor and was headed for the RV show in Tampa the next day. NeXus RV was founded in 2010 by Claude Donati and Dave Middleton, who both boast a pedigree in motorhome manufacturing. When they launched this new company in the middle of a recession, they decided to sell directly to the consumer. While some may have called them crazy, they have never looked back. They continue to increase sales since rolling out their first Type C motorhome early in 2011. Prospects and customers talk directly to the company owners, who are passionate about bringing customer service to new levels in the RV industry. With the factory-direct-sales philosophy, company officials set out to produce a Super C on a medium-duty commercial truck chassis for approximately $50,000 less than the nearest competitor marketing this type of motorhome. The result was a cool starting price of $139,999 at the factory. The Ghost is built in the spirit of all great motorhomes that have come before it. It has an optional mystical full-body paint scheme that will add $6,999 to the sticker; automatic Quadra leveling jacks will add another $3,400. The beautiful truck out front is built for over-the-road commercial operators, offering features seldom found in the traditional trucks used in the manufacture of other motorhomes or the van-type chassis found on most Type C products. As such, when service is needed, you can visit just about any truck stop in America and find somebody capable of working on this engine/transmission combination, which is not concealed under a small hood in front or under a bed in the back of the unit. A noteworthy feature of the TerraStar truck chassis is the forward-opening, full-tilt hood, which allows for easy access for service and maintenance while standing on the ground. Under that hood is a powerful 300-horsepower MaxxForce 7 turbo-diesel V-8 engine (644 pound-feet torque), coupled with an Allison 1350 five-speed transmission. This proven engine uses dual sequential turbochargers to deliver powerful performance. The smaller primary turbo responds quickly for immediate power at low engine speeds, and the larger secondary turbo provides peak power at higher speeds and on steep grades. The precise high-pressure fuel injection system features electronically actuated piezo injectors that deliver up to five independent injections per cycle for smooth, full combustion. The engine reportedly is quieter, cleaner, and provides better fuel efficiency without any urea tanks needed. The 2,000-square-inch windshield is made of double-ply glass that resists rock chips and provides enhanced visibility. This allows the driver to see objects closer and possibly detect unexpected situations sooner. An unusual three-piece hood configuration allows the owner to fix only the fender or center section should damage occur, a feature that could save thousands of dollars on any needed repairs. The cab is all steel, and the truck has the deepest wheel cut in its class, allowing for tighter turns and facilitating turnarounds. The driver and passenger are protected in front by a chrome grille and bumper. The 80,000-psi frame rails are welded and bolted. This offers a solid, rigid, and comfortable drive for the motorhome attached above it. The features built into this truck are far too numerous for an article that is supposed to be about the motorhome, but I predict that you will like the self-diagnostic electrical system that integrates the engine, transmission, instrument cluster, and body into one simple reporting system. The headlights come on automatically when the windshield wipers are activated, which helps the driver to comply with what is now law in many states. The unit makes an audible beep if you remove the keys without setting the brake and even offers a quick walkaround feature that flashes all exterior lights so you can ensure they are working properly for driving at night or through inclement weather. NeXus employees surround the living quarters of the Ghost with all-steel-cage construction. The high-strength low-alloy steel is said to provide superior support and a rigid framing with solid welds and galvanized steel screws. The 7-feet-4-inch interior height creates a cavernous look and feel that also allows for more cabinets, not to mention artisan woodwork and moldings. Also worth noting is the LED lighting that is used throughout the interior. At the rear of the Ghost 34G is a king-size bed with the headboard positioned in a street-side slideout. The opposite side contains a full wall of cabinets and drawers, including two wardrobes. A television mounted in this bank of cabinetry swings down to reveal another large storage area behind it. A large shower unit faces into the bedroom. The street-side area that contains the sink and toilet has a door that can be closed for privacy or swung open to create a large bedroom suite setup. An additional sliding door closes off the shower and bedroom. Forward of the bedroom suite is the galley, which features a street-side corner sink with overhead cabinets and recessed lighting that illuminates this cooking area very well. The corner sink unit incorporates cabinet and drawer storage. Also on the street side is a countertop range and microwave oven built into the slideout. A contrasting tile backsplash matches the décor of the coach as well as the solid-surface Corian counters (including covers for the sink and range). Opposite the range and microwave is a four-door Norcold refrigerator-freezer, positioned just before the side entry door. The street-side slideout also houses a sleep sofa, and a curved dinette is situated across from it in an opposing curbside slideout. The laminate wood-look flooring is a nice offset to the interior colors used in the coach I examined. Carpeting covers the floor in the bedroom. The overhead sleeping area houses the swivel-mounted television, which can be viewed from the galley-living area or the bed over the cab. I was told that the company plans to refine and enhance this area of the motorhome, including some cosmetic requirements that were to be included in the full-production models of the Ghost. The exterior compartments, large and many of them, are made of galvanized steel that is rustproofed and foam-sealed to protect items stored within, and to improve the ride. The house portion is built on a super-truss system designed to transfer all the weight of the motorhome to those 80,000-psi rails for a smooth and solid ride. The Ghost offers 50-gallon black and gray water tanks, along with a 100-gallon fresh water supply. The unit has an on-demand water heater with a 67-pound propane tank. A dual fuel fill, with two 40-gallon tanks, is handy for refueling from either side of the island. I was unable to perform a full livability review on this test unit, nor did I have an opportunity to weigh the coach. That said, I can tell you that the NeXus Ghost has a 19,500-pound gross vehicle weight rating (GVWR) on a 224-inch wheelbase and a 30,000 pound gross combination weight rating (GCWR). In addition, the coach is equipped with a 40,000-Btu furnace, 50-amp electrical service, and a 2,000-watt Freedom 20 inverter. Several manufacturing techniques offer competitive advantages to the NeXus product line. For example, a full one-piece seamless fiberglass roof is used; it actually wraps over the exterior edges of the motorhome to eliminate troughing and potential leaks inside the exterior walls. The one-piece fiberglass front cap and wings are also seamless to prevent leaking. Sidewalls and roofing do not contain any wood; they are made of Azdel composite substrates, which eliminate odors and double the R-factor for better interior comfort. Automotive-style window seals also eliminate potential leaks and squeaks. The NeXus Ghost is a distinctive motorhome that, I predict, will garner the attention of many professionals who drive trucks, fire engines, and heavy equipment and know the quality behind an International truck. Others will be attracted to the Super C configuration because of the serviceability of the truck itself when it is needed. Still others will find the protection of the steel cage and that big engine out front very appealing. As the newest member of the NeXus RV family, the Ghost easily connects the International truck line with a luxury Type C motorhome that many experienced RVers will want to examine when looking for their next coach.